It always seems to happen just before a big event, like a new date, a big interview or family photos, when you really want to look your best — the dreaded breakout. Arrgggg! But did you know that those obnoxious little red bumps are your body’s way of trying to tell you a story about what is happening on the inside of the body? It’s like shining a flashlight into those deep, dark crevices we think we can’t see. Your body sends signals all the time, like how burping, gas and bloating could be a sign of poor eating hygiene or it could be connected to LOW stomach acid. Or how catching every cold that goes around is a warning that your immune system is weak or how that rumbling in your belly usually means your hungry. Acne on the face is no different. But what’s really interesting is the theory called ‘face mapping’ which suggests the location of your acne is a clue to what is causing it. 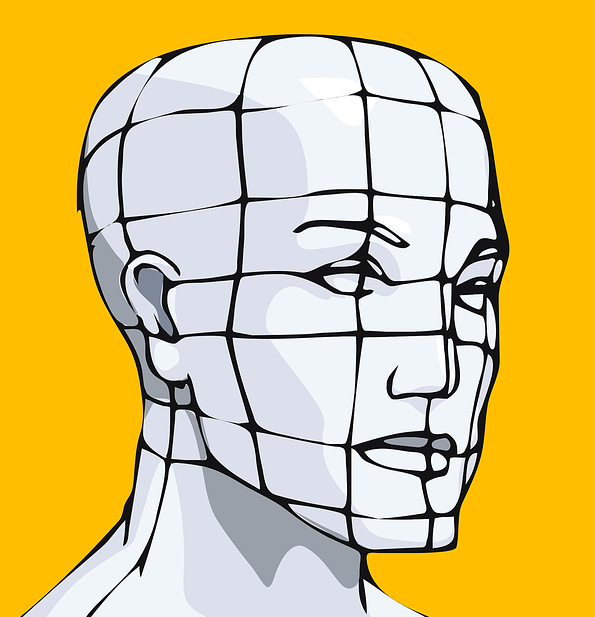 Each region of the face is connected to an organ or gland in the body. 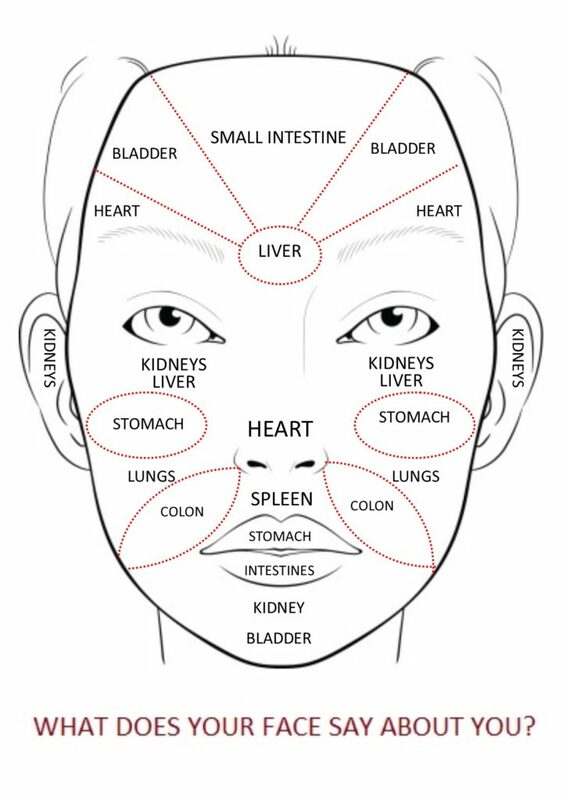 An imbalance in that organ can result in acne showing up in the corresponding face region. You can use this key information to understand why you are breaking out, help the organ in need AND keep your face less prone to future issues. Pimples found on the forehead are usually connected to the digestive system, which could mean you are having trouble breaking down food, there’s a build up in the colon, elimination issues or other digestive distress. This area is also prone to wearing caps/hats on hot days. Try: Digestive enzymes or bitter herbs before each meal to help you break down foods. Add in probiotics to your diet, keep hydrated and reduce stress. The dreaded brow zit just might the one I despise the most. You might also see redness, flakiness or excess oil too. This area is linked to the liver so take a close look at your diet for this- greasy, fatty foods or too much alcohol will show up in this area. Try: Stick to healthier food choices, don’t eat late at night and go easy on the cocktails. Drink dandelion tea or start your day with warm lemon water to support your liver. While pollution and sinuses can affect this area thanks to a stressed respiratory, don’t overlook excessive bad fat, sugar and stimulants as the cheek and lips culprit. Look for pimples, redness and flaking. If you find the left and right cheek are different, there’s a reason- the left is connected to the liver and the right to the lungs. Try: Cut back on dairy, get regular exercise and drink plenty of water. Quit smoking and get plenty of fresh air. Welcome to the hormone, reproductive organ and digestive issue area. Puberty, period and pregnancy can show up here along with digestive distress. Try: Manage stress, get enough sleep, and detox your system. Balance your hormones with healthy omega-3’s, vitamin D and magnesium. Avoid hormone-disrupting chemicals. Also keep from resting your chin on your hands as this spreads germs and exacerbates issues. Blotting linens are amazing and picking up extra oil on your skin and reducing shine! Pimples, large pores and blackheads show up here. Stress, hormonal changes and lack of sleep can lead to clogged pores, especially if you have oily skin. However, don’t overlook stress, alcohol and high blood pressure or cholesterol as possible reasons.